Earlier this year, I wrote a post about how to schedule Pinterest pins for free without the use of a paid pin scheduler. I thought it would be worthwhile to revisit this subject as Pinterest has completely changed the way my blog receives traffic. When I first started blogging, the majority of my traffic was coming from Twitter. Once I decided that I needed to grow my audience and increase my traffic, I turned to Pinterest. I read so many blog posts about how Pinterest was the leading referral for blog traffic, but I couldn't figure out how to make this happen. To give you a true example of how implementing a Pinterest scheduling plan, I thought I would share my referral history from Google Analytics. Below is a snapshot of how my blog traffic has grown from creating a regular pinning schedule. As you can see in the photo, in February I was only receiving around 1,000 referrals a month from Pinterest. On a side note, this was the same time I made the decision to treat my blog like a business instead of a hobby. Once I implemented my Pinterest strategy, my traffic started to increase in March and April. Although extremely risky, in May I decided to back off from my Pinterest pinning schedule. I wanted to see what would happen to my traffic if I stopped using a Pinterest schedule. Almost immediately, my traffic tanked! In June I decided to stop this crazy experiment and restart my pinning schedule on Pinterest. It took a little bit of momentum to get started again, but my referral traffic started to slowly increase in July. By August, my Pinterest referral traffic increased by 400%, with 10,000 referrals to my website from Pinterest alone. That's a lot of growth in a short amount of time! As you can see, it's extremely possible to grow your blog traffic, simply by creating a Pinterest strategy and schedule! Creating a manual schedule to pin on Pinterest can be time consuming, especially when first starting out. It can also be a little tricky if you have dozens of pins that need to be scheduled. As your blog grows, it can be worthwhile to consider switching to a Pinterest scheduling service. Luckily, there are options if you need help with how to schedule pins on Pinterest. I recommend Tailwind. One of the best features of Tailwind is the program's amazing insight of when to schedule pins, your peak performance times, and what key words in your Pinterest descriptions get the most clicks. Tailwind also offers a free first month of pinning and then has different membership levels, with the yearly membership the most cost effective. If everything seems a little overwhelming or you simply don't have the time, you can hire one of my Pinterest students to help you. I help bloggers and small businesses figure out how to grow their presence on Pinterest and increase their traffic to earn more income online. 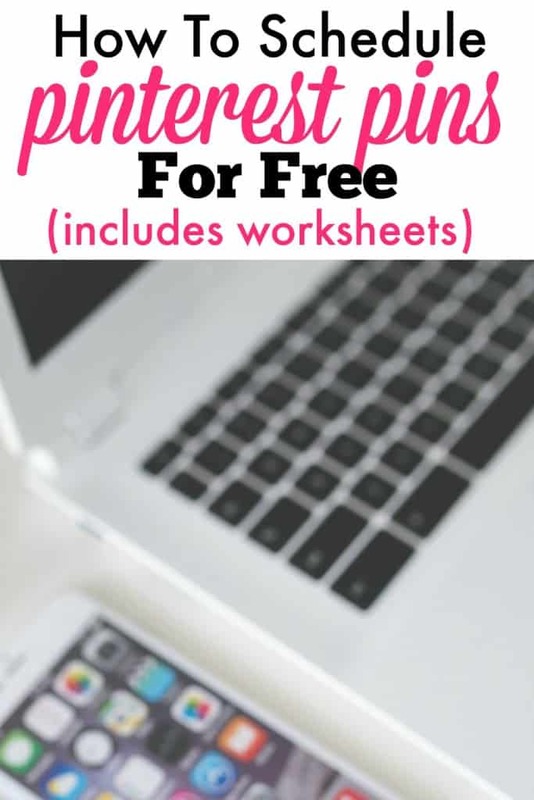 Whether you are just getting started with Pinterest or are ready to step up your Pinterest presence, I created a free Pinterest pinning worksheet that everyone is welcome to use. You can print it as many times as you want! These worksheets really helped me when I was starting out, and I still refer to it when using my editorial calendar and planning posts for the month. I also created instructions and tips to get started pinning on Pinterest. How often do you use Pinterest? Helpful and Great Post! I love Ruth she is Awesome I however can not afford her program she does once a year maybe some day. You may want to remove Board Booster from your post they are no longer in business. Pinterest doesn’t allow them to pin to their site. Great post, and highly useful information. Hi, Kristin, you mentioned in the mentioned the title about scheduling Pinterest pins for free. But, all those tools that you mentioned are premium ones. They just give a trial period. Is there any completely free tool? Not that I know of anymore. I used to include a printable/download to schedule pins, but it got too complicated. If you are serious about getting traffic to your website and have a limited budget, I would spend money on a service like Tailwind or BoardBooster! I probably need to update this post because the free options are gone! I’ve got a question… when scheduling pins – do you just find royalty free images that relate to your niche on Google and post them with a link to your blog? I just don’t pin often enough. I keep hearing about Tailwind. Must give that a try and see if it ignites my Pinterest traffic. Hey there! You will definitely get more traffic if you schedule pins automatically so you don’t have to worry about doing this manually every day. Let me know if you have more questions! This was a great post!! I actually just purchased Tailwind earlier today as my free trial period ended. I’ve been back and forth with blogging lately, but I’ve decided to go all-in, which means paying for certain services to make my life easier! I paid for the year and it’s been worth it! It seemed like a good deal for unlimited pinning. I’ve been using BB too, but have pretty much switched to Tailwind. There’s pros and cons to both, but I like the unlimited pinning feature Tailwind has!